How to sync iTunes library to Nabi 2 since it is non-Apple devices? The best iTunes to Nabi 2 converter helps you get rid of iTunes authorization limit and Apple ID loins required to playback iTunes purchased or rented HD/SD movies on Nabi 2 tablet. Nabi 2 is a full-featured tablet made especially for kids and it delivers a wide range of experiences to engage, entertain and educate kids, including kiddified Web browsing, watching iTunes movies and TV shows, reading books, learning math and playing games. Because Nabi 2 is a true Android tablet, it grows with kids over time rather than being discarded like toy tablets. Utilizing the nVidia Tegra 3 Quadcore processor and Ice Cream Sandwich 4.0 Operating system, so, enjoy iTunes movies and read e-books on the Nabi 2 1024×600 resolution screen is very fast. DRM on iTunes and Nabi 2 Android tablet? Can I play iTunes on my Nabi 2 Android 4.0? Based on the above analysis, these questions are to be expected. Files protected with Apple’s DRM scheme can only be played on Apple devices/software. If you want to play iTunes movies on your Nabi 2 tablet, you have to remove the DRM protection from iTunes movies and then convert iTunes M4V movies to Nabi 2 supported video formats (MP4 with H.264 video codec is highly recommended), and with 3rd-party app. Now just download it and follow the step-by-step guide below to learn how to remove DRM from video and convert iTunes purchased movies to watch on Nabi 2 tablet for your kids. How to remove DRM protection and convert iTunes video for Nabi 2? Note: To ensure the success of the conversion, you need to install iTunes and make sure your videos play well in iTunes. Otherwise, the conversion may fail. After you download and install the best iTunes to Nabi 2 converter, launch the program and click the “Add…” button at the top to load the itunes video files you want to transfer to Nabi 2. Batch conversion is supported, so you can add as many videos as possible, include M4V, M4P, M4B, WMV, WMA, ASF, AVI, MOV and more. From the “General” tab, specify your preferred destination folder for saving output files. From the “DRM Finder” tab, customize search parameters for the DRM Finder tool. From the “Processing” tab, set the program to perform up to five parallel conversions. Here you can click “Video files to” and select “MP4” as the output format from “Common Video” or “HD Video”. 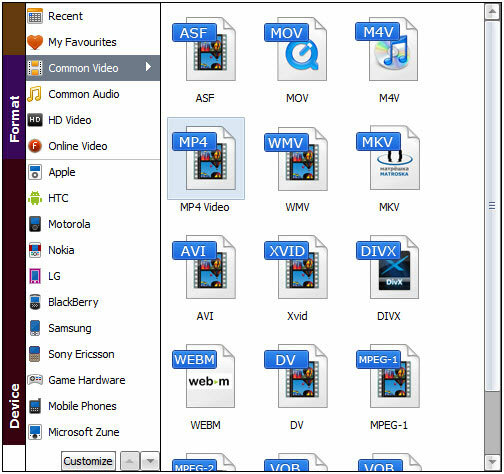 As you can see, besides MP4, lots of output options are provided like WMV, MKV, FLV, AVI, MOV, etc. and video presets for iPhone, iPad, iPod, HTC, Samsung, LG, PSP, etc. Tips: If you have specific needs concerning video or audio quality, click the Settings button at the bottom (there are separate buttons for audio and video) to select the output format you want, then, you can set the video parameters (resolution, frame rate, encoder, and bit rate) or audio parameters (such as sample rate, channel, encoder and bit rate). For Nabi 2 tablet output, 1024*600 video size, 1500kbps video bitrate are much proper. Once you’ve finished all the settings, click “Start” button to begin your iTunes to Nabi 2 mp4 conversion at fast speed. After conversion, you can click the “Find Target” button to open the output folder and find the converted files and transfer them to your Nabi 2 with ease. How to transfer video files to Nabi 2 tablet? There are more than one users are facing the issue how to get files from PC to Nabi like the above user met. Here we’ve figured out two ways for you. 1. Plug the Micro USB cable from your computer to Nabi 2. 3. Next, look for a “Music,” “Movies” or “Photos” folder, or create your own to organize the files you are saving on Nabi 2. Select the files you would like to transfer from your computer by dragging and dropping them into the folder. 4. Once all files have been transferred, safely remove your device: Click Safely Remove Hardware on the bottom right side of your computer screen, then click USB Mass Storage > Stop. 5. Open the files by going to the Music or Gallery app on your Nabi 2 tablet. nabi Sync is currently available to download on personal computers running Windows XP with Service Pack 3, Windows Vista, Windows 7 and Windows 8, and Mac computers running OS X Lion or higher. 1. First, download and install the nabi Sync on your PC. 2. Open the application. You will see the Welcome screen when you launch nabi Sync for the first time. Click Start Now to get started. Tip: Before you can sync your files, you will need to pair nabi with your PC. To pair Nabi 2 Tablet with your PC, tap the nabi Sync app on Nabi 2, located in Mommy/Daddy Mode, and make sure Nabi 2 and your computer are connected to the same Wi-Fi network. Next, select the files on your computer that you want to sync with Nabi and click Sync. Finally, your Nabi 2 videos, photos and music will be transferred to your computer, and the content you selected on your computer will be transferred to Nabi 2. That’s all! Now you’re ready to get the converted iTunes movies onto Nabi 2. It’s that easy! If you’re going to H.265/HEVC video, 3D/4K video and DVD movies to Nabi 2 or other Android/iOS/Window based device for playback, you can get Wondershare Video Convertr Ultimate to encode videos to play on your device smoothly. Plus, this software is also a DVD burner and YouTube downloader. With a totally free plug-in, Wondershare Video Converter Ultimate Guide will become a “Aimersoft DRM Media Converter”. It enables do everything Aimersoft DRM Media Converter can do. 1: After installing Wondershare Video converter Ultimate on your PC successfully, download the totally free DRM protection removal Plug-in here. 2: Double click this .exe file and select “Install”, wait for a minute, then you can use Wondershare Video converter Ultimate to rip copy-protected DVD movies and DRM-protected videos. Want to try this powerful app? Download the free trial version above or buy securely online for $49.95 to enjoy your common/commercial video anywhere without any hassle! I do not know who you’re however definitely you’re going to a famous blogger if you happen to are not already. Cheers!